4 classes per day. 1 class equals 45 minutes. 5 to 10 students per class. Content of the Spanish course for the group: the person in charge of the group can decide this, or Delengua will organise it. Class material, Spanish level test, and attendance certificate included; as well as the organisation of activities and access to the internet and library. Native and highly qualified teachers. Half board accommodation with a Spanish host family (breakfast plus one other meal). 2 students from the group per family, in a double bedroom. 13 nights: arrival on Sunday (at any time), and departure on Saturday (by 12 midday). Walking distance between the school and the host families: between 5 and 15 minutes. A teacher/guide from the school will always accompany the group. Pick-up service: Pick-up service in a private bus at Malaga airport (and return journey). Pick-up from Malaga airport, and journey to Granada in a private bus. Lunch or dinner with host family. Guided visit of the centre of Granada. Spanish course. 4 classes of 45 minutes each. 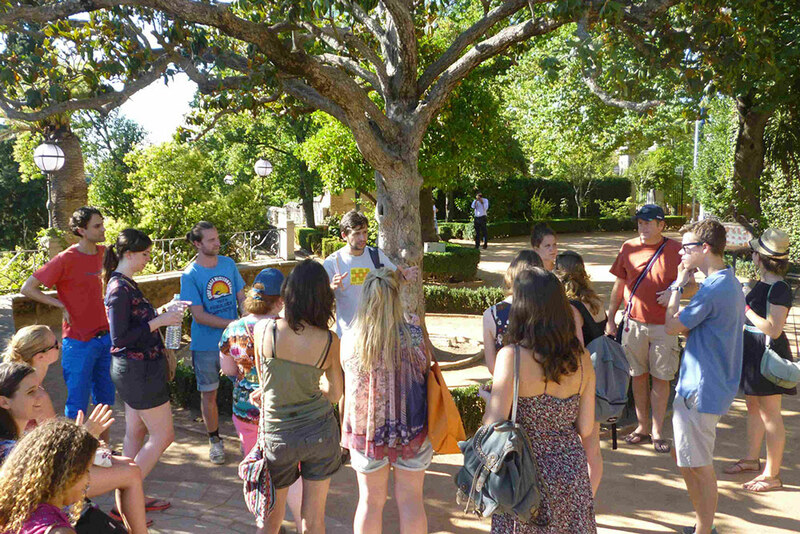 Thursday: guided visit of the Alhambra and the gardens of the Generalife. Saturday: 9.00am Trip to Seville or Cordoba. Private bus. Visits of the main attractions. Return to Granada around 9pm. Sunday: 9.00am Excursion to the Alpujarras mountains and to the coast (Salobreña or Almuñecar). Private bus. Return to Granada around 8pm. Monday: guided visit of the San Jerónimo monastery and surroundings. Tuesday: visit to the house/museum of Federico García Lorca in Fuente Vaqueros, Granada. Wednesday: cinema to watch a film in Spanish. Thursday: Scavenger hunt around Granada’s sights. Friday: afternoon free for shopping. Evening of tapas to say goodbye. Saturday: Breakfast with host family. Departure in private bus from Granada to Malaga airport. Our experience (we were founded in 1997). We adapt to your wishes and requirements. Prices among the most competitive in Spain.